Automatically the word ‘featuring’ indicates that the person is of significant importance. Well up until the Frontiers Festival I’d never heard of Lenna Kuurmaa. To be honest, given the lackluster / limp / boring (delete as appropriate) performance on Day 2 of the aforementioned (but excellent) Festival, I thought that Moon Land featuring Lenna Kuurmaa (Jesus, I’m already fed up of typing this title) deserve a second chance as the circumstances leading to their performance, which seemed like a complete lack of preparation, did them no favours whatsoever. Apparently Estonian Kuurmaa is a 360-degree performer - singer, actress and TV personality. Lenna has been the front-woman of the Pop-Rock outfit VANILLA NINJA, an all-female outfit, which debuted in 2002 with their self-titled album and went on to release internationally another 3 successful studio albums (which won Gold Records awards in Germany, Austria and Platinum in their home country, Estonia). In 2005 VANILLA NINJA also won the selection to represent Switzerland in the Eurovision Song Festival with the song "Cool Vibes", ending at the 8th place. VANILLA NINJA however went into hiatus and the members started to get involved in different projects. 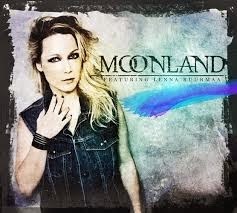 Lenna Kuurmaa appeared as an actress and TV presenter in Estonia and started a musical solo project under her own name, until she was approached by Frontiers Records with a concept to be return with a new international release with songs tailored for her singing style, with musical influences ranging from Heart and Europe with a touch of Roxette. Frontiers ‘go-to’ guy, the diminutive but most excellent singer / songwriter / keyboardist/ producer Alessandro Del Vecchio taking care of the production duties. Without being repetitive, the remaining songs on the album basically follow suit. It’s the kind of inoffensive record that the likes of my wife would like – listenable, but not critical. Ideal as a background setting, but nothing else. To be fair, MFLK has enough going for it to be given a second outing. Whether or not a certain head honcho at Frontiers allows this to happen remains to be seen. On the evidence of this debut, Kuurmaa deserves to be given a second chance, as her voice is the highlight of what is a lackluster album.